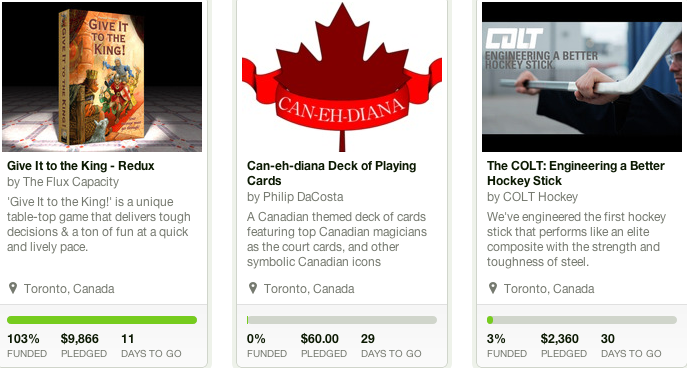 Kickstarter has finally arrived in Canada. More specifically, Canadians can now start projects, which will prevent disasters like Ottawa’s Chameleon Launcher’s initial misfire from happening again. Kickstarter is an online crowdfunding site that has raised over $600 million to date, despite being limited to the United States and the United Kingdom. Popular items like the Pebble Smartwatch, Memoto Lifelogging camera, ChargeCard and, my favourite, Espro’s dual-filter coffee press, have emerged from the site, and the company launched an iPhone app earlier this year to make browsing easier. The company hosted a special workshop yesterday in downtown Toronto to teach Canadians how to optimize their projects for the service, and are encouraging others to request an event in their cities. Despite only being available for a few hours, dozens of Canadian projects are already on the site, and nearly 3000 people have decided to pursue a Kickstarter from within our fair country. Projects are listed in Canadian dollars, and processing fees are fairly low — 5% and 5c for pledges of less than $10, and 3% and 20c for those greater than $10 — for projects that reach their funding goals. You can see all the Canadian-hosted projects on one page, and hit the company’s blog for all relevant information.